This past week’s release of the city’s new property tax reassessments has prompted a lot of conversation. In the neighborhoods around Tower Grove Park, single family homes saw an average increase of close to 30% in assessed value. Some owners saw increases in their property’s assessed value much higher than that already striking average increase. While many southside residents were alarmed by the steep increases in their assessed values, it is undoubtable that many northside residents were dismayed to see their homes’ values continue to decline. The changes in appraised values are just one part of a more complex property tax story. Passed in 1980, the Missouri Constitution’s Hancock Amendment limits the amount of tax revenue that a city can collect compared to the prior year. While folks mainly think of the Hancock Amendment as the reason sales tax and other increases have to pass at the ballot, it actually has numerous provisions that limit government revenue growth. One section of Hancock intersects with rising house appraisals and the rate of taxation on a given property. Through this mechanism, which we will discuss further, there is a ceiling on the city’s potential tax revenue, and the base property tax rate is set by the total amount of assessed value in relation to that maximum revenue. In articles about newly released property assessments, this issue has been mentioned, but compared to all of the column inches devoted to the increasing appraisals, the declining taxation rate has generally been buried in the stories. Yet the taxation rate and the appraisals are intrinsically tied, due to the previously mentioned revenue growth limitations imposed by the Hancock Amendment. Hancock limits this revenue stream’s growth to 5% or the state’s rate of inflation, as measured by the Consumer Price Index (CPI), whichever is lower. The current year’s certified CPI is 2.1%. (It fluctuates from year to year, but it tends to be between 2% and 3%.) So, while the city may have seen a 12% growth in total assessed value, the schools, and other vital services like libraries and mental health services, are only collecting 2.1% more revenue. This 2.1% cap sets a maximum dollar amount of revenue, and when assessment growth surpasses 2.1%, the base tax rate is lowered to collect the maximum amount on the new amount of assessed value. In some years, the legally permissible increases are even lower. For instance, 2015 and 2016 saw CPI increases of 0.8% and 0.7%, respectively. 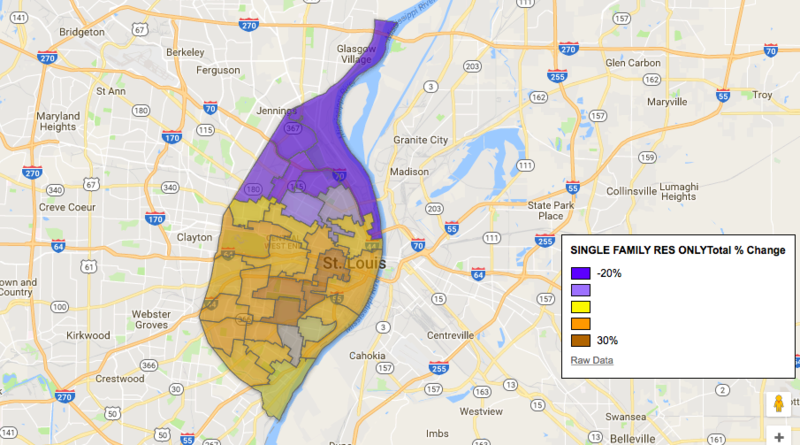 So how does Hancock intersect with tax abatements in St. Louis? Due to this little talked about provision of the Hancock Amendment, tax abatements not only relieve their beneficiaries of paying taxes, but they also slightly increase the tax burden on the city’s non-abated property owners. Going back to the previously explained method of setting the base tax rate, it follows that properties that are abated do not fully enter into the calculation of the total assessed value. With the total assessed value artificially low, Hancock decreases the base tax rate less than it otherwise would. Think of the increased revenue limit as a finite pie, capped at a specific capacity. In a world where abated properties don’t exist, all property owners would be equal partners in contributing to this pie, relative to the value of their home and the tax rate. However, because we live in a world where abatements do exist, while the abated properties are contributing to conditions which raise assessed values in their vicinity, they are not liable for the increased burden that brings. Going back to the pie reference, this leaves non-abated property owners paying for their slice of the revenue pie, as well as picking up the tab for a little bit of the piece that would otherwise be paid for by their abated neighbors. This means that the abated rehab in Shaw is raising the tax burden on the non-abated house next door, if the non-abated house saw an increase in assessed value. In short, the stronger the overall real estate market, the more the middle and working class families in less-abated south and north side neighborhoods shoulder the burden of paying for our schools and other property tax-funded services. So while the abatement next door contributes to conditions which help in determining your property’s assessed value, it also helps determine the base tax rate and the amount you pay on your property’s newly assessed value, based on which properties are available to help meet the new revenue allowed by the Hancock Amendment. To think about it another way: Even though many folks argue that lots of new tax revenue is good for the public schools (schools receive more than 60% of property taxes revenue), in reality the amount of new revenue available is limited to a 2.1% increase, no matter how much the city’s total property value increases. The Hancock Amendment makes it difficult to use our tax base to truly increase school funding, as the allowable increases are almost always limited to the rate of inflation. As such, even if the whole city was rebuilt and revitalized, our school district’s per-pupil funding from current property taxes would be too slow to actually catch up with suburban districts that have had stronger real estate markets. What does this have to do with abatements, etc? Once again, the Hancock’s limits on tax growth don’t impact the assessed values of property, only the tax rate imposed upon said value. Many residents in gentrifying south side neighborhoods saw an increase in assessed values; their home values have appreciated considerably. Meanwhile, many residents of the north side are still seeing the effects of redlining continue to destroy housing values and make it nearly impossible to finance rehab and even just upkeep in many neighborhoods. This pattern continues to devour black wealth and power, perpetuating the intergenerational cycle of poverty that traps so many St. Louisans. By doing so, we are forcing non-abated homeowners to subsidize families that are wealthier than the average homeowner. This is an indirect form of wealth redistribution. As their properties are abated, they not only pay taxes on the lower value that the assessment was frozen at, but they also end up raising the tax burden of those without abatements who did see an assessment increase, due to the way the Hancock Amendment limits local revenue growth. This is how an abated $300k+ house in Forest Park Southeast increases the taxes paid by a family in North Pointe who may have had an increase in assessed value, even if the family in North Pointe sees no tangible benefit from that FPSE abatement. At the same time, other families in North Pointe are locked out of credit access necessary for home improvements and neighborhood upkeep, due to the overall declining values of their homes, which continues to be driven by the racist impact of redlining and longstanding market biases against majority black neighborhoods. This challenge makes preserving middle market neighborhoods in north St. Louis almost impossible. The establishment of a “Greenlining” Fund is one way to proactively bringing resources and investments to these communities. Abatements are inflating sale prices in the Central Corridor and near south side, which makes northern neighborhoods relatively less attractive for investment. (The obvious exception is around the future NGA site, which is seeing lots of interest from investors). In many ways, while increased assessments around Tower Grove Park, Forest Park, and Downtown are a win-lose for those neighborhoods (property values up, but tax burdens also increasing), the situation is a lose-lose for most north side property owners (value of property in decline while tax rate inflated by central/south abatements). As a new session of the Board of Aldermen commences, we will see if increasing assessments and unhappy constituents drive members of the board to reconsider their habit of approving every proposed abatement, no matter the market strength of the neighborhood in which the property is situated. Remember, many of these abatements are approved after contracts are signed or even after closing on the homes. In many areas, abatements are not actually necessary. We will see if a majority of the Board is willing to publicly recognize that fact and redirect the use of abatements to areas that actually need the “market making” support of abatements to increase investment. A crucial consequence of these policies is that the abatements keeping property taxes higher for a majority of the population in turn make it more difficult to convince residents to pass further debt to finance the city’s capital and payroll needs. If the board is serious about generating new revenues, incentive reform must be a key part of the equation. P.S. Check out this RFT article that accompanies the interactive map we created on average changes in assessment, ward-by-ward.